In today’s age of technology, coding and logic-based skills are becoming increasingly in-demand across job markets. 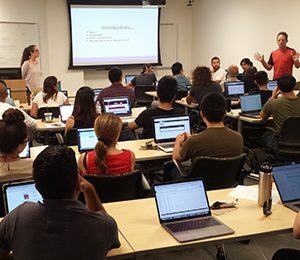 At The Coding Boot Camp, our Full Stack Flex program teaches you the key skills for front-end and back-end web development, all while preparing you for success in the professional world. Join together with your classmates to tackle demanding projects and get hands-on training through experiential learning opportunities. Use your new skills to build a dynamic portfolio of applications and projects, showcasing your knowledge to potential employers. Gain an edge in the field through our wide-ranging career services such as technical interview preparation, resume and social media support, portfolio reviews, job matching, soft skills training, and more. Receive a Professional Certificate from UCLA Extension, demonstrating your many achievements. Whether you choose our 24-week, part-time program or our 12-week, immersive program, you’ll go through a rigorous and rewarding experience. Through live classes and collaboration with your peers, you’ll gain proficiency in the theory and application of web development.